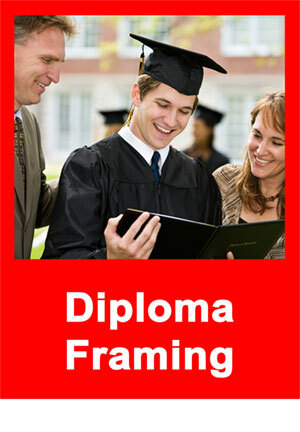 Friends Don't Let Friends Buy Bookstore Diploma Frames - by Tamis Fastfrrame Frame Shop and Custom Framing Service. Whether your new college diploma is from Harvard or the technical college down the street, you worked hard to earn it, toiled for hours and spent untold a fortune in blood, sweat, tears and greenbacks to get it done, Right? And you are busy person, right? So why not just slip that new diploma into a frame purchased in the college bookstore or purchased via the flyer slipped in with that fine piece of paper shipped to you once the bills are paid and the grades are in? Well, be careful. 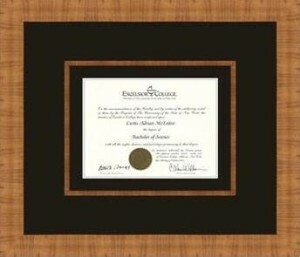 I’m not saying that a great diploma frame purchased this way does not exist. They might. But we’ve examined quite a few of these products and have not found a bookstore frame “done right” yet. We’ve had the chance to check out these mail order and bookstore frames when a client drops it by because of broken glass, as an example for us to match or perhaps to have us complete assembly. After seeing dozens, we’ve yet to see even one bookstore or mail-order frame that has all of the components needed to make sure your diploma lasts for years and years with out fading and/or deteriorating. We’ve not seen an example of UV coated glass and most are full of crummy components that will CAUSE your diploma to start fading away in just months. 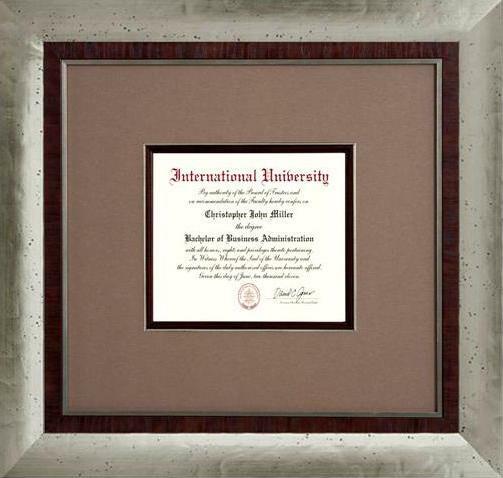 Three components are needed to help preserve diplomas: Acid free matting, acid free backing and conservation grade glass, which is coated to filter UV rays from hitting your diploma. You also have to know how to adhere that precious piece of paper to make it last–and, no, scotch tape, masking tape or duct tape are not the way to do it. No, picture framing is not brain surgery but we’ve seen some shall we say “interesting” assembly jobs. Do what you do well and leave the picture framing to FASTFRAME. The frame is the “pretty” part but has less to do with preservation–we have many choices (thousands, actually) in all styles and prices ranges and we will help you find one that is just your style and matches your budget. We might be a little biased, we we think we have a great selection of really nice looking frames that will look great on your walls. 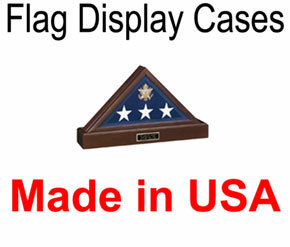 No plastic or extruded foam like we’ve seen from some mail order places or discounters here!